Telltale Games is usually the first that come to mind when thinking of a game with branching decisions where every choice affects the outcome, but you’d be wrong to compare Late Shift to a Telltale title. In fact, Late Shift could much more aptly be compared to something on Netflix, Hulu, or Amazon Instant Video, because Late Shift is not a game. It’s a choice-based movie, which is the same as Wales Interactive’s previous “game,” The Bunker. Think back for a moment at every time you’ve ever wanted to yell “Run you fool!” at the screen, or tell the main character to keep his or her mouth shut instead of saying something stupid. Choice based games have gamified this idea, but often have far too great a focus on the “game” aspect of it, with the result being a game at the core, with cinematic aspects. 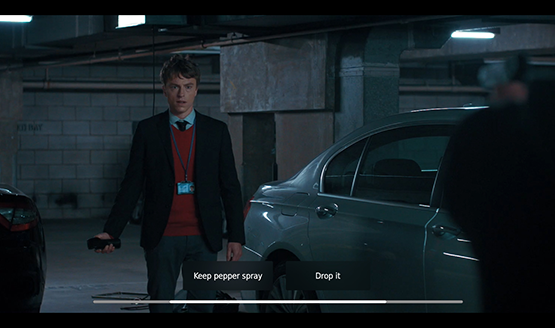 Late Shift flips the tables and keeps the cinematic experience of a movie while adding quick choices that pop up on the bottom of the screen with a short timer. Try to run or do what the mugger says? Give the girl the keys to the car or ask why she wants them? Keep your mouth shut or try to talk your way out of it? There’s no controlling a character in Late Shift, aside from the selection of which actions to take as the movie progresses. As each action is chosen, the movie continues uninterrupted by the process, and for anyone else in the room, they are effectively just watching the custom choose-your-own adventure movie that is Late Shift. I really cannot stress that aspect enough. 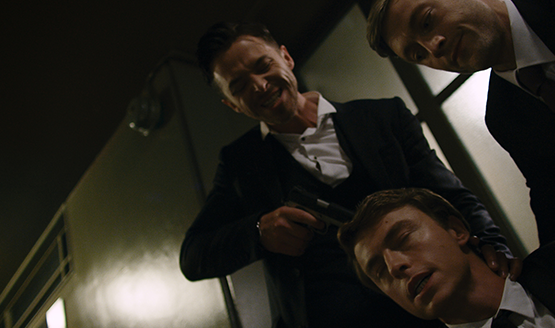 Late Shift is a movie with an interactive facet. Period. Usually my free time consists of either deciding what game I am going to play or what show I am going to continue to binge through on Netflix. Late Shift meets both of those needs, allowing me to get the cinematic fix I might get from watching a thrilling movie, while requiring enough interaction that I need to remain consistently attentive and alert to what’s going on so I can make the next snap decision that pops up. Late Shift is an exciting movie about a young man named Matt who works the late shift at a parking garage. Very quickly he finds himself wrapped up in the terrifying heist of a priceless artifact that ultimately threatens his life, and he must make difficult choices about how to proceed as the theft and events that follow play out during the night. The overall film production is excellent, with an operating budget of $1.5 million and a script by the same author of 2009’s Sherlock Holmes (Yup, the same one with Robert Downey Jr. as Mr. Holmes himself), so there’s certainly some weight behind the filmmakers. Interactive Film or Cinematic Game? In some cases, you may find Late Shift to be too much on one side or the other. If you really want to play a game, Late Shift may end up being too much of watching through something. On the other hand, if you want to relax and watch a movie, you might not want to always have your hand on the controller, ready to make a decision for the main character at a moment’s notice. It’s a minor quibble, but one that puts Late Shift in a very odd place in terms of interactive media, as there isn’t much else explicitly like it out there. There are over 180 decisions to potentially make throughout the film, with seven different endings depending on your choices. An average viewing takes about an hour and a half, so it lands on the shorter side of feature length productions. When you’re constantly needing to be aware of the next decision though, this length is perfectly adequate, especially near the end when you really feel the weight of everything you’ve chosen beginning to sink in. What I discovered in my couple of viewings was that the writing and scenes shot for each of the branching sections felt very fluid to the actions, emotions and dialogue that preceded. Only occasionally does Late Shift go into the next scene a little too quickly, causing the last split second of the current scene to cut off. It’s not often, and very hard to tell when it does this unless there’s a line of dialogue before the shift. It’s one of the only real criticisms because it’s hard to critically analyze the plot of a movie that can turn out entirely different for everyone that views/plays it. Character development — most notably of Matt — is entirely dependent on which path you choose to send him on, so if you don’t like how it turns out, you have only yourself to blame. Late Shift is an excellent FMV game and a unique point in interactive cinema. It’s a vastly interesting new way to allow the viewer to change the outcome of the movie they are watching, but has the very odd position of trying to sell itself as neither a movie or a game, but at the same time, both. What I am most interested to see is how Late Shift impacts the future of media. It might just be a flash in the pan, but if we end up one day having an Oscar nominated film that is also a Game of the Year contender, I can safely say that Late Shift will be seen as the original piece of interactive cinema that provided the catalyst for that potential combined media future. Late Shift review code provided by publisher. Reviewed on PS4. For more information on scoring, please read our Review Policy.